2 lever nut electrical connector for easy connections of wires. 5 lever nut electrical connector for easy connections of wires. Foam with adhesive, 3/8” thick x 3/4” wide. When ordering specify the length in feet. Replacement sight gauge tube only (Per Foot, 9/16" OD x 3/8" ID). Classic Edge 350, 550 & 750 models use 6" length. E-Classic 1450, 3200 & 3250 models use 6" length. E-Classic 1400, 2300 & 2400 models use 7" length. Forge 1500 & 3500 models use 9" length. Classic 4030, 5036, 6048 & 7260 models use 9" length. Pallet Burner models use 14" length. Components replace original components. Fuse, 5-A Rubber Clamp accessory for holding cleaning tools. Includes one clamp. Mounts with bolts or screws (not included). Size: .63" - 1.38"
Replacement O-ring for Hot Filter (part number 101). Replacement antenna only for FireStar XP Outdoor Wi-Fi Module, RP-SMA Male, 6.6” Rubber Clamp accessory for holding cleaning tools. Includes one clamp. Mounts with bolts or screws (not included). Size: 1.00" - 2.25"
Replacement snap action door switch for E-Classic Ignition Ready/Dual Fuel models, Classic Edge 350/550/750 models and Forge 1500/3500 models. Replacement chimney brush handle only. Handle is a component of Chimney Cleaning Kit (part number 2500296) for cleaning both the horizontal and vertical portions of all 6" chimneys. Replacement 48" fiberglass chimney brush extension rod only. Fiberglass extension rod is a component of Chimney Cleaning Kit (part number 2500296) for cleaning both the horizontal and vertical portions of all 6" chimneys. Mounting bracket for 1200K shell & tube exchanger (part number 5600010). Includes two mounting brackets. 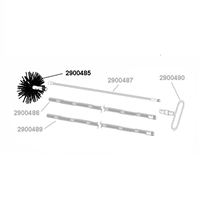 Replacement 48" twisted wire chimney brush extension rod only. 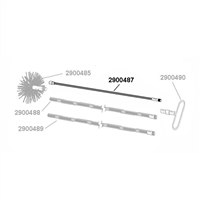 Twisted wire extension rod is a component of Chimney Cleaning Kit (part number 2500296) for cleaning both the horizontal and vertical portions of all 6" chimneys. Note regarding shipping: This is an oversized product cannot be shipped via USPS Priority Mail. Please choose UPS Ground shipping method upon checkout. Used to connect a 24-volt thermostat to existing thermostat for a heat pump. Gauge is 1/8" MPT, 1" diameter with 1" stem length, for use in tight areas. Temperature Gauge, 1/8" MPT Hot water filter cartridge (#10) for Hot Water Filter (p/n 101). Tool with six interchangeable heads for straightening fins on water-to-air heat exchangers. For all units with 8,9,10,11,12 and 14 fins per inch. 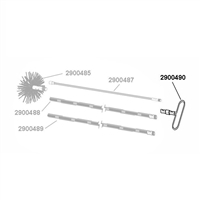 Replacement 72" twisted wire chimney brush extension rod only. 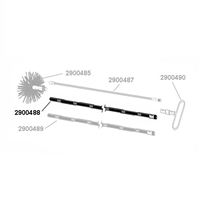 Twisted wire extension rod is a component of Chimney Cleaning Kit (part number 2500296) for cleaning both the horizontal and vertical portions of all 6" chimneys. Replacement 6" Chimney brush only. Brush is a component of Chimney Cleaning Kit (part number 2500296) for cleaning both the horizontal and vertical portions of all 6" chimneys. Measures accurately the moisture level of wood with a range of 6% - 42%, and the ambient temperature (°C/°F). Mini in size and portable for field works, very easy to operate and delivers accurate readings instantly. In-line, dial temperature gauge with 1/2" MPT (p/n 174) and 4" stem is optional for manifold, pool heater, systems, etc. Temperature Gauge, 1/2" MPT Firewood Bag is produced from a unique white woven ventilated polypropylene fabric that provides optimum air flow through the bag during storage. 2500-lb carrying capacity, four 10" loops for forklift handling. Size 36"x42"x58".